The age of antiquity is one of the most popular settings for online video slots and Novomatic has taken this well-trodden desert path with Pyramid Fortunes. It’s a 5 reel, win all ways video slot that comes with classy design (yes, a Novomatic game!) as well as a free spins with high value symbols only, plus a jackpot round. Play on your computer, tablet or mobile from between 50p and £5 per spin. The design renaissance at Novomatic continues. In fact, we’d go as far as describing Pyramid Fortunes as one of the Austrian developer’s best-looking titles. The visuals are bright, ornately detailed and very easy on the eye. The setting is the interior of a pyramid. On the reels you’ll find lower value royal symbols as well as higher paying hieroglyphs done in the style of golden jewels. The most lucrative symbol is the Egyptian Queen. This will get you an award of 1, 3 or 12 times your bet if you land 3, 4 or 5 in combination. The Eye of Ra is the wild. There are 2 versions of this, both of which substitute for all of the standard symbols. The Blue Eye appears on reels 2 and 4 only while the Red Eye can hit only on reel 3. When the Red Eye wilds form part of a winner, the payout is doubled. Pyramid Fortunes isn’t just a pretty face. There are a couple of extras to consider here too. Free Games feature – land 3, 4 or 5 scatters left to right on the same spin and you’ll pocket an award of 5, 10 or 50 times your bet as well as triggering 10 free spins. These are played on reels where all of the lower value A to 9 royal symbols have been removed. 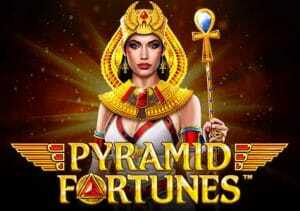 Jackpot feature – there are 4 potential jackpot prizes on offer in Pyramid Fortunes. The round can trigger on any spin where a wild is present. Then choose from the 12 objects. Behind each one lies a coloured gem. Land 3 of these that match and you’ll win the associated Mini, Minor, Major or Grand jackpot. While the visuals offer something novel for a Novomatic video slot, the gameplay here is just what we’ve come to expect from this developer. It’s not complicated but delivers a potentially volatile payout punch. There’s nothing very new to discover here (the classy imagery aside). The simple formula offered by Pyramid Fortunes is appealing enough though which makes it one to consider if you like the Egyptian theme or Novomatic powered games. Alternatively, Leprechaun goes to Egypt from Play ‘N Go is worth trying.